Take Your Turkey from Holiday to Every Day! When you think about a whole roasted turkey, what comes to mind? Indulgent family feasts with sides of stuffing and gravy, or healthy weekday meals, such as stir-fries, soups and power bowls? We here at Canadian Turkey say it’s both! Make the most of your whole turkey dinners with planned extras. Here’s our plan to build amazingly delicious, super nutritious every day meals using planned extras from your whole bird celebrations. No turkey leftovers? No troubles! 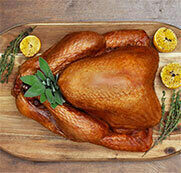 Turkey parts take less time to cook than a whole bird, making parts ideal for weekday meal planning. Cook a big batch of turkey parts, such as thighs or a breast (or two! ), keep extras in the fridge and use them in these meals. Lean and Luscious Legs. Dark meat is feel good food; it seems indulgent because of the juiciness and flavour, but it’s actually a lean choice. And dark meat is best for this spicy noodle dish. The broccoli slaw and whole wheat noodles give you a hit of plant-based antioxidants. Bring on the Breast. Extra turkey breast meat means you can skip salty processed deli meats and build a better-for-you sandwich. The Gobbler is a sweet and savory sandwich with a crunch and it’s perfect for a packed lunch. Love ALL the Leftovers. Turkey adds a protein punch to your salads. Whether you’ve got extra white meat or dark meat or both, we love it all in this Turkey Apple and Kale Grain Salad filled with super foods like kale, squash, farro and the power protein, turkey! The Bare Bones (AKA the carcass). Once you’ve enjoyed all the tasty roasted turkey meat, use the carcass to make a rich, tasty homemade broth that you can stir into a scrumptious soup. Make the most of your whole turkey dinners with planned extras. See our easy-to-follow chart.